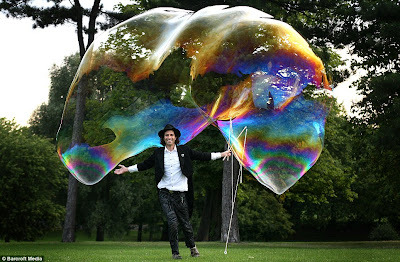 Samsam (real name Sam Heath) was aiming to pop the Guinness World Record set in 2005 in Minnesota, U.S., for a bubble of 105.4 cubic feet. 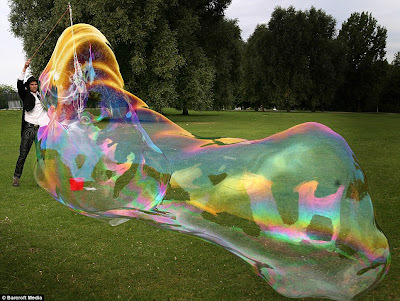 He is not sure of the precise volume of his attempt in Finsbury Park, North London, but it stretched to 20ft by 5ft by 5ft at its biggest. He is now waiting for official confirmation. 'I'm confident it has obliterated the former record,' he said. 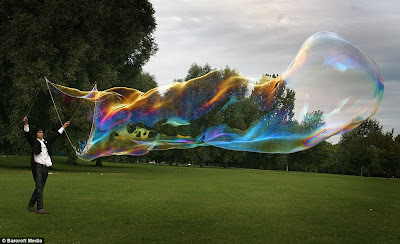 Samsam, pictured with his creation, refused to reveal the recipe for his bubble mixture, saying it is the secret to his success. 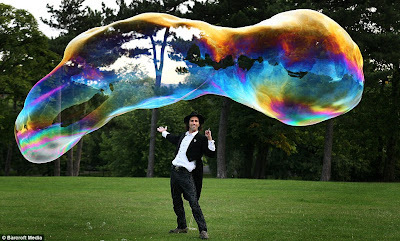 'With the right stuff you can make big bubbles with anything - a coat-hanger or even just your hands,' he said. He developed the top-secret mixture over 20 years of trial and error.